Already the first Monday of November and an UMT: Wibble by Shawna Martin it is. A quite easy to draw tangle and also elegant. The only problem I had was what to draw next to it. So, that was the first I tangled after Wibble and then the rest just followed. Thank you for visiting my blog and I hope you leave me a comment; I do appreciate that a lot. Work created by fellow tanglers can be seen at 'I am the diva'. I love what you did with this pattern and tile. There's a wonderful energy about it. These are very pretty colours as your background and I like the mix of patterns too. Fraai gecombineerd met de andere tengels, ze vormen een mooi geheel. De ster links vind ik echt geweldig naast Verve. Mooie kleur ook weer! Such a fun tile! I l��ve me some purple! Love the color of your tile and the tangle selection with Wibble is great! Mooie kleur, leuke patroontjes en prachtige compositie. Your wonderful tile in such soft color looks very friendly. I love Crazy N'zeppel too and like to use it. Love the "sunflower" and how Wibble flows through it all! My name is Annemarie and I live in a small town in the centre of the Netherlands. I got married in 2006 with Kees and have two grown children. 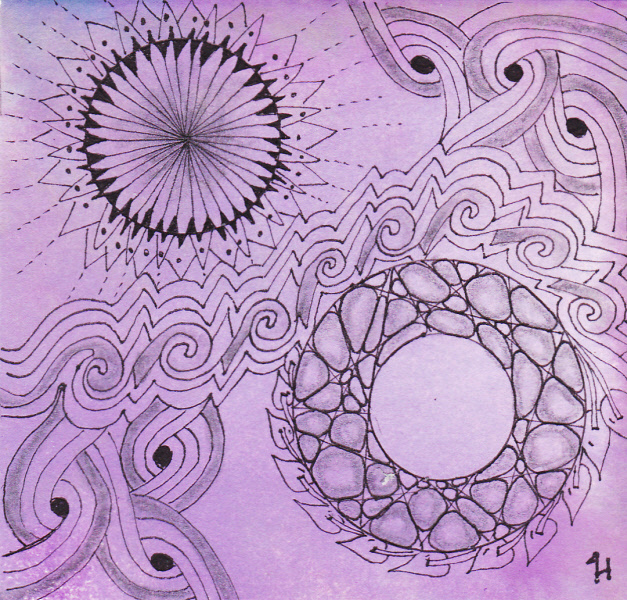 Around 1994 I took a number of courses: mandala drawing, form drawing and drawing chakra's. Because I 'can not draw' I stopped after these courses. But ..... in the summer of 2011 a friend told me about Zentangle and since then I am totally hooked. Not being able to draw, and with this method being able to make beautiful zentangles and zia's! My other hobbies are: reading, writing (poems), listening to music and PC games.